The Seahawks see their season end in the divisional round of the playoffs for the second straight year, this time falling to the Falcons 36-20 in the Georgia Dome. ATLANTA — They had no choice but to admit that it was the end of a season. The end of an era, though? 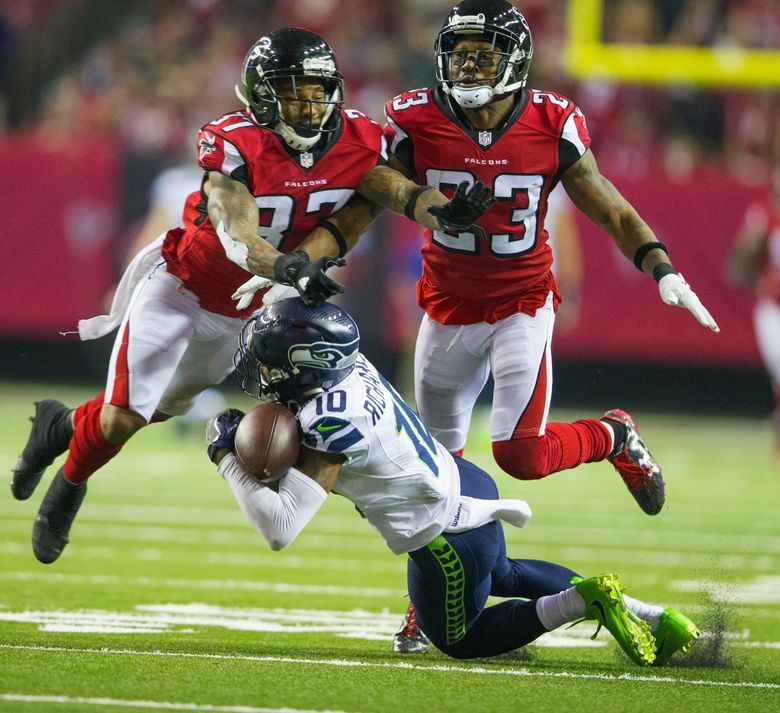 The Seattle Seahawks resisted that thought in the locker room afterward almost more than they had the Atlanta Falcons on the field the previous three hours in losing a divisional playoff game 36-20 Saturday. The defeat came four years and one day after a 30-28 defeat against Atlanta ended a season that stamped Seattle as a team of the future, potential fulfilled with a victory in the Super Bowl the following season. And if some might wonder what this defeat means in regard to where franchise is headed, Seahawks coach Pete Carroll said he thinks the future could still be as bright as it was four years ago. 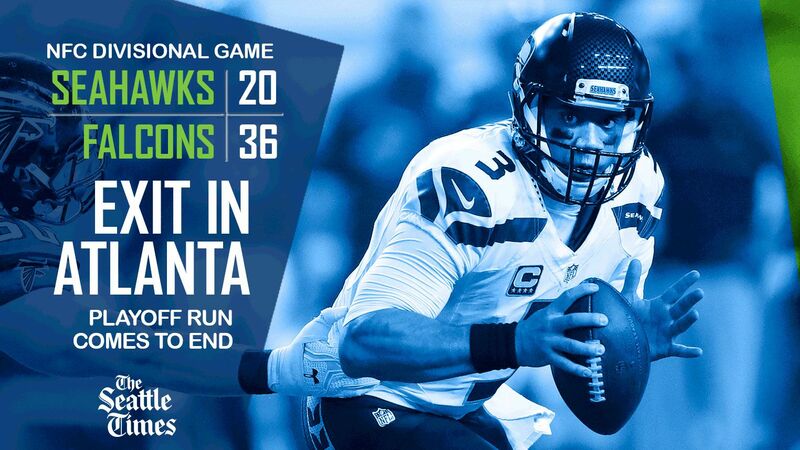 Still, Saturday at the least showed the Seahawks have some work to do to get back to where they want to be. It was a game that shifted precipitously on one play — a holding call on linebacker Kevin Pierre-Louis early in the second quarter that negated an 80-yard punt return by Devin Hester that would have had the Seahawks at the Atlanta 7-yard line, already leading 10-7. Instead, Seattle was moved back to its own 7, and two plays later Russell Wilson tripped over the foot of lineman Rees Odhiambo and was tapped down for a safety. That kicked off an onslaught of 19 consecutive Atlanta points. Everyone agreed later that the penalty — which came when Pierre-Louis got engaged with Atlanta backup linebacker LaRoy Reynolds and threw him down as the ball was being punted — was a turning point. Pierre-Louis didn’t dispute the penalty, saying Reynolds got under him and that he “took a chance’’ at trying to stop him from getting off the line. That the Seahawks couldn’t do that, though, might in some ways be the larger lesson of the game. Wilson called it “a fluke play’’ when he stumbled into the end zone for a safety. He said he was dropping back to pass and was trying to get out of the end zone after falling before being tapped down by Ben Garland. As crucial as that play was, though, what followed in the game exposed all of Seattle’s flaws. Atlanta drove for a field goal following the free kick to take a 12-10 lead. Seahawks coach Pete Carroll gives opening statement following playoff loss to Atlanta Saturday. 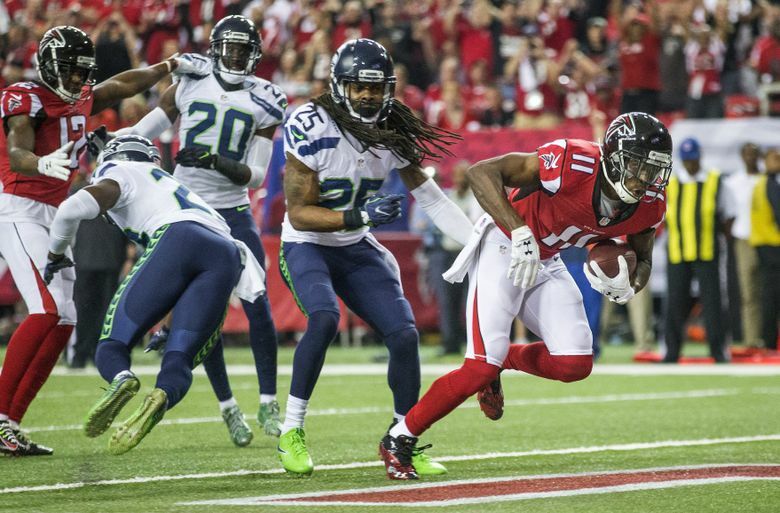 The Falcons then stopped Seattle three-and-out, and after Jon Ryan’s punt rolled dead at the 1-yard line, Atlanta drove 99 yards in nine plays — never needing to convert a third down — to take a 19-10 lead with 53 seconds left in the first half. Atlanta then got the ball to start the third quarter and drove 75 yards for another touchdown to take a 26-10 lead and that was pretty much that. The Seahawks had come out well to start the game — driving 89 yards for a touchdown on their first drive. It was the first time they had scored a point in the first half of what was the fourth road divisional game under Carroll. But after Thomas Rawls rushed for 29 yards on six attempts on the first series he had just 5 yards on five attempts the rest of the game. And while Seattle knew it would have a hard time stopping an Atlanta offense that scored the most points in the NFL this year of any team since 2013, its defense again looked surprisingly vulnerable without All-Pro Earl Thomas manning the free safety position and it was unable to get a consistent pass rush with just four linemen. It was the third time in six games without Thomas that Seattle allowed 34 or more points, while Matt Ryan’s 338 yards passing were the most against the Seahawks this season. The season ended for the Seahawks with Atlanta deciding to take a knee at the 2-yard-line rather than try to score a final touchdown, an uncharacteristic end to a season that from the first game — when Wilson suffered a high ankle sprain — never really went as planned. And, Carroll made clear, he has no doubt other chances like it will come on other days. Seattle had 10 possessions Saturday and produced two touchdowns. The Seahawks committed two turnovers and had one possession end in a safety. Also, Seattle gained 180 yards on its final eight possessions after gaining 129 on its first two drives.